Of the Spheres is a series of outdoor immersive performances investigating how human beings relate to the vast time durations and massive scale of the universe. 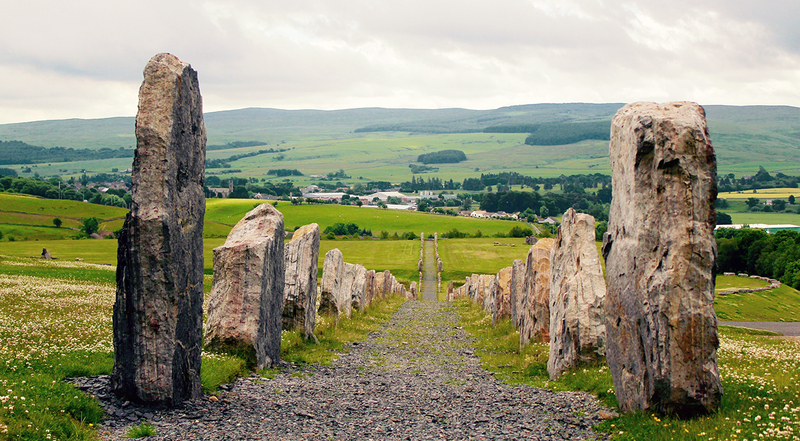 The Summer Solstice marks the next phase of Of the Spheres with an immersive project at the Crawick Multiverse, a cosmic sculpture park inspired by contemporary space science in rural Scotland created by Charles Jencks. We have made workshops with the pupils of Sanquhar Academy. The students have devised their own stories of the land in workshops with a team from the Multiverse as part of the project’s focus on Sharing your Sphere : inviting individuals to tell their own stories of their land through panoramas. This project culminates with an outdoor Virtual Reality performance for the land art site the Crawick Multiverse in Scotland, UK. These performances invite audiences out onto the land in a participatory communication experiment that combines Virtual Reality and touch. This phase – named Terra Incognita – is as an outdoor Mixed Reality adventure in going beyond the personal sphere of experience to say hello to the unknown. The Of the Spheres project is focused on how emerging technologies provide new modes for artfully experiencing planetary perspectives. Inspired by Voyager 1’s journey into intergalactic space, Of the Spheres explores how we can communicate human experience, contemporary understandings of our planet and the cosmos and our attempt to work together globally. In 2013 the Heliosphere performance ran in a 360 degree Projection Dome.